What we’re about to show you is not for the faint hearted. If you like campers that are plain and safe then look away now, because this teardrop camper is like a swiss army knife on wheels. They call it the FronTear, and it’s an absolute off-road monster! The World’s Best Teardrop Camper? You’d be forgiven for thinking that a Teardrop camper was just a cosy little trailer that you took into the forest for a romantic weekend away, because that’s mostly what we thought too. Then we came accrues the FronTear and our opinion changed for good. 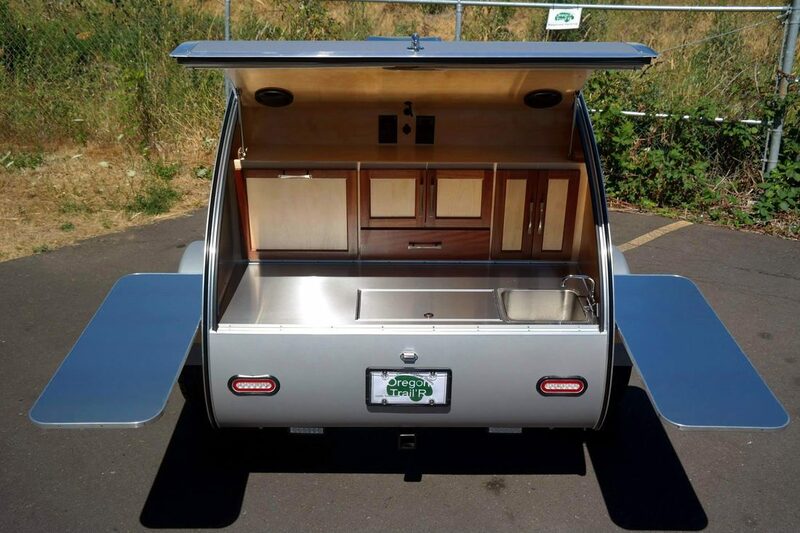 If you’re looking for a camper that can cope with off grid living and is as up for adventure as you are, then the folks over at Oregon Trailers have got the answer. 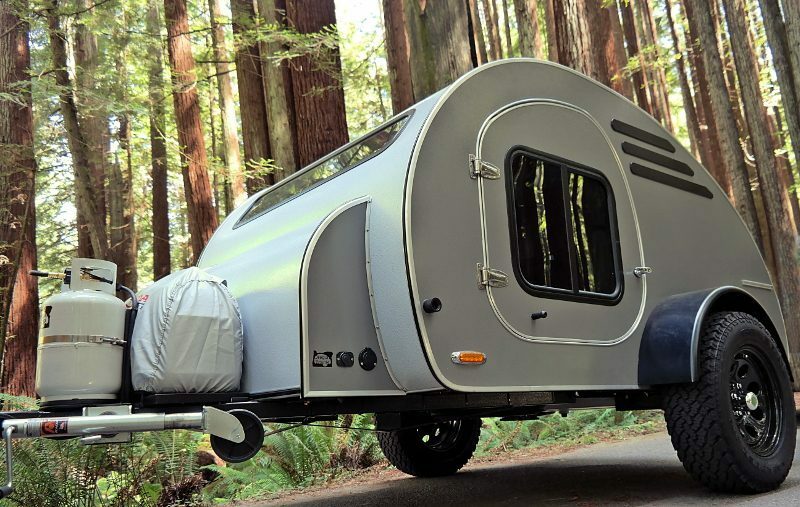 What’s So Good About A Teardrop Trailer? Well, I’m glad you asked. Not only are they steeped in history and an iconic part of camplife and vandwellers as we know it, but they’re also friendly on your car and the environment. 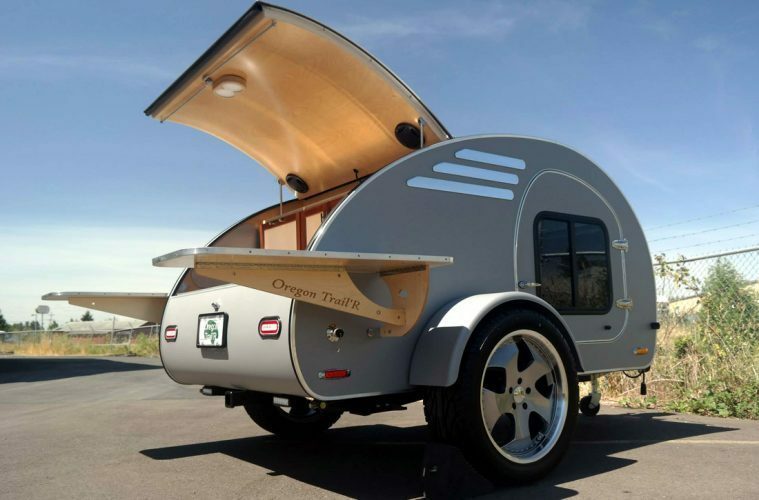 A teardrop camper has ‘minimal impact on your tow-vehicle’s fuel economy’, which is one advantage of their small, light weight build. They also have minimal contact with the ground; a tent takes up a large space and might kill off the grass underneath it, but a teardrop will only touch Mother Earth with it’s two tyres and levelling jacks. But most importantly, a teardrop trailer really gets the digital nomad party going. No other off grid living camper other than a classic VW really gets your pulse racing. They’re conversation starters, and because they’re small you can keep them in your garage all loaded up and ready to roll, meaning that you can get out into the wilderness and start living off the grid at a moments notice. Tell Me More About The FronTear! 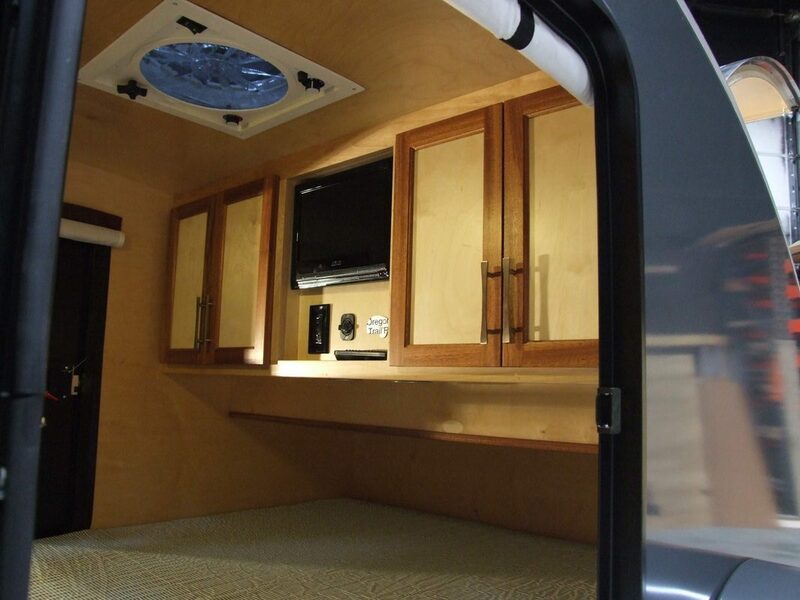 The FronTear tear drop camper has a pretty big living space inside, with the entire floor space being taken up by a huge bed. No need to worry about making up that rock’n’roll bed anymore, because the FronTear is ready to roll whenever the z’s hit you. It’s pretty simple inside, with just a bed, some charging ports, cupboards, a TV on an adjustable bracket and minimal storage so you can fit your biolite fire pit. But that’s the beauty of a decent teardrop camper; they only have what is absolutely necessary on the inside, so that you can spend more time adventuring outside! The FronTear has everything including the kitchen sink built into it’s outer casing, so you and your friends can crowd around after a hard days riding and grab a plate of hot food to fuel up for the next adventure. 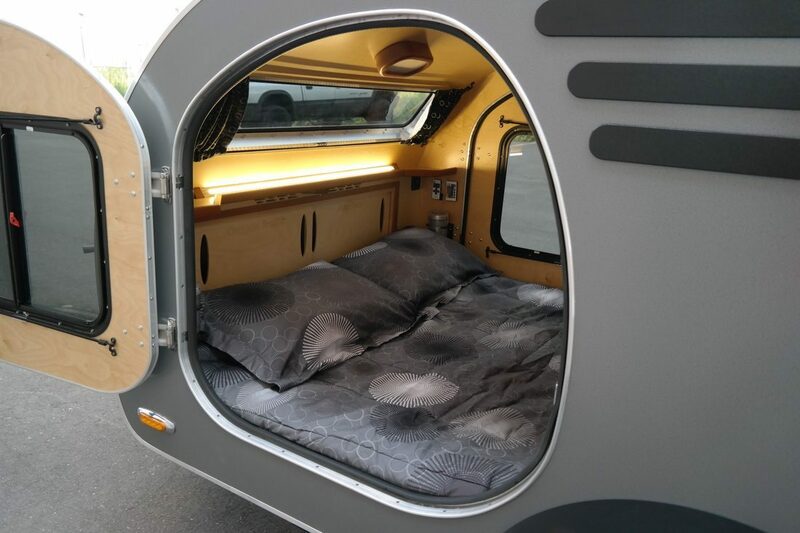 Now if you are looking for even more space in a teardrop camper then pop up campers might be something worth looking at. 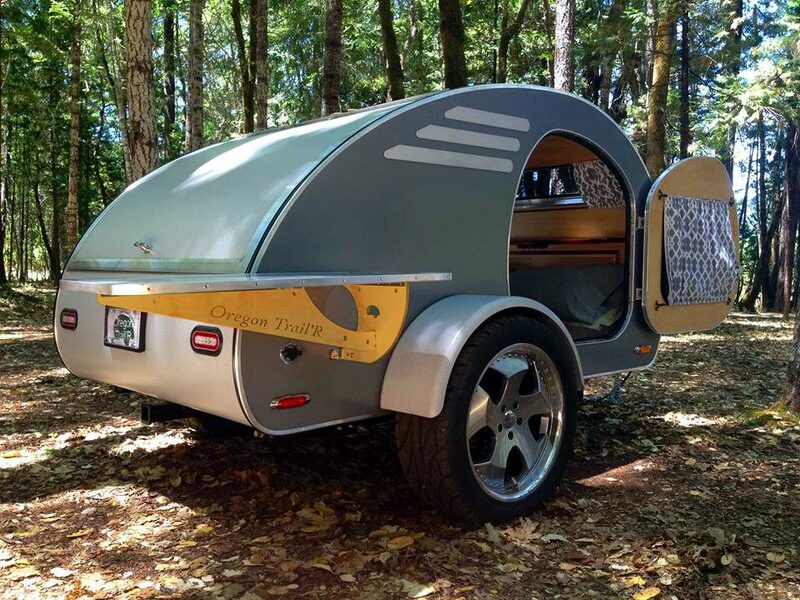 If you’re looking for an off road teardrop camper then the FronTear is definitely the trailer for you. It packs a punch whilst still remaining lightweight and funky fresh. 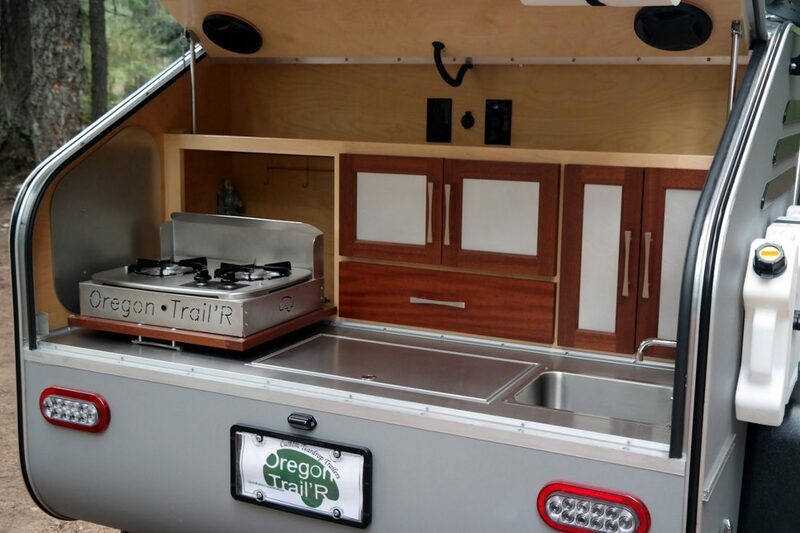 It might not be exactly what you think of when you imagine a rustic teardrop camper, but Oregon Trailers know full well that rules are always meant to be broken! 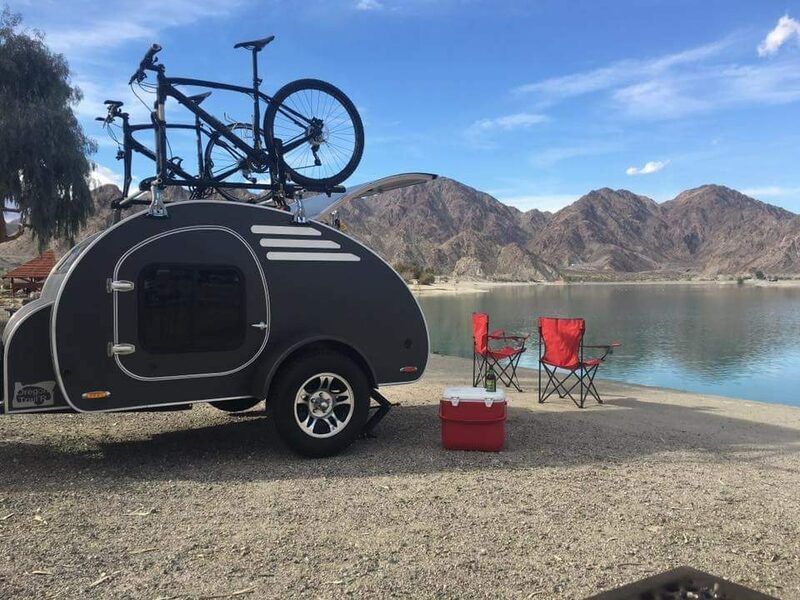 Like Trailer Campers? Check out the Taxa Mantis Trailer!